D.L. Karlen, G.E. Varvel, D.G. Bullock, and R.M. Cruse, Crop Rotations for the Twenty-First Century. G.S.P. Ritchie, The Role of Dissolution and Precipitation of Minerals in Controlling Soluble Aluminum in Acidic Soils. J.G. Davis, Managing Plant Nutrients for Optimum Water Use Efficiency and Water Conservation. J.P. Quirk, Interparticle Forces: A Basis for the Interpretation of Soil Physical Behavior. Subject Index. 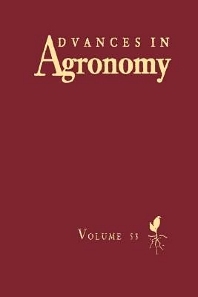 Advances in Agronomy increased its publication frequency to three volumes per year in 1993, and will continue this trend as advances in the field dictate. Volume 53 contains four excellent reviews which cover an international spectrum of advances in the crop and soil sciences. One of the most important areas of research, sustainable agriculture, is treated in a comprehensive article in crop rotation in the twenty-first century. Aluminum in acid soils and the factors controlling its behavior are detailed in a second article. A third long review explains the role of nutrient management on water quality, which is now a critical issue for environmental conservation. The final chapter is a definitive treatise on interparticle force effects on physical behavior of soils, which has crucial influences on plant growth and yield. Researchers and students in agronomy, plant and soil sciences, and environmental sciences in university, industry, and government laboratories.